At only 195 pages, Ayu Utami’s controversial novel Saman did not take long to get through. Yet this novella managed to portray four interlinked characters with distinct voices and stories. I have never read anything set in Indonesia, or written by an Indonesian author, so it was interesting to have this glimpse into life in such a diverse and tumultuous region. The first chapter is written from the point of view of Laila, who is having an affair with Sihar, a married man. She reminisces about their first meeting, and the titular character Saman is briefly mentioned. The second chapter is then Saman’s own story – describing his childhood, entry into the priesthood, and then the conflict between a small Sumatran community and a palm oil company that he disastrously becomes involved in. Shakuntala, a childhood friend of Laila’s, is the voice of the third chapter. She talks about their circle of school friends and their adolescent sexual exploits, which causes trouble with some of the girls’ parents. Another of Laila’s schoolfriends, Yasmin, narrates the fourth chapter and describes the aftermath of Saman’s involvement with the Sumatran village, showing a side to Saman the reader hasn’t seen before. This leads into the final chapter, which contrasts with the rest of the book as it is structured as a series of emails between Saman and Yasmin. Although I’ve read that Utami was disappointed with the English translation of her novel, I found this book a fascinating read. It was very different from any novel I’d read before – reflecting people’s lives in a way that is simultaneously realistic and fantastical. I don’t want to give away any spoilers, so I’ll just say that it was impossible to guess how the stories would unfold. 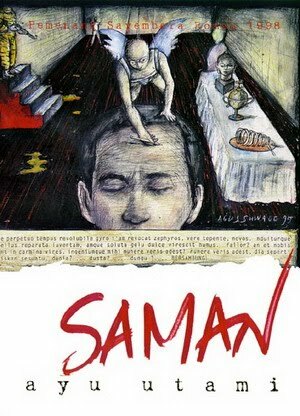 Because of its occasionally explicit nature and discussion of taboo subjects like extramarital affairs, female sexuality, religion and corruption, Saman has been the source of quite a lot of controversy. However, I would really recommend it to anybody interested in Indonesia specifically or world literature.